Tetlow King Planning successfully represented Omenport Developments Ltd. in an appeal in the London Borough of Islington. The appeal proposal was for permission to display advertising for a temporary period of up to two years on scaffold shrouds whilst a major hotel development is implemented on a cleared brownfield site. 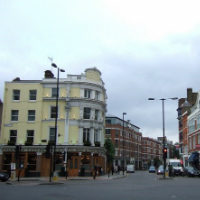 The primary issue to overcome was whether the shrouds presenting a representation of the proposed hotel incorporating four commercial advertising displays would be detrimental to its sensitive location within a Conservation Area and adjacent to the listed the Hat & Feathers Public House, also under refurbishment by Omenport. The appeal site was situated at a prominent location at the intersection of Goswell Road, Clerkenwell Road and Old Street. The Council’s UDP policies were strongly opposed to advertising in Conservation Areas. The Inspector, having considered the evidence concluded that the two scaffold shrouds incorporating four advertising sites would be beneficial to the amenity of the Conservation Area and adjacent listed building, by providing a tasteful alternative to unsightly construction works and shabby scaffold nets for the construction period. Therefore temporary permission was granted for the displays to cover the hotel’s development period.